In the Interview on your homepage from 2007 it said that there won´t be any reunion due to the long time you would be absent from your sons due to preparation of a tour. But they are still there, right?  Or are they old enough now so that you can be away a longer time from them? Also, in addition Ted meant that a reunion without playing live won´t be worth it, so the matter of playing live must have been the definite question to answer, right? Well....a couple of things here. My son is now a bit older....you know with kids, they grow up fast, and they become more independent and less ‘needy’. Plus, he’s getting to an age with getting into the teens where the idea of his dad being in a band is a pretty cool thing! I’m really in a different place in life now than back in 2007, it’s amazing how just a couple of years can make such a difference! But, there’s been some tough challenges in life that have made me come full circle, and get re-acquainted with the ‘old friend’, being music. Plus, what we’re doing here is not planning on any full blown touring, but rather, a gig here and there where we’re wanted, where it makes sense for us to do, so we wouldn’t be gone for any great length of time. But who knows, I suppose a bigger tour sometime in the future is not out of the question! How do you consider your chances to get a proper record-deal? Would this be a one.off or would you try to commit the Band for a longer time again? Honestly we’re not even considering any ‘record deal’. Things are so different these days, the way it use to work with the “big machine” of record companies is so different now because of technology. We’re doing things on our own, today’s technologies make this possible....so this is very satisfying and no pressure....although it does mean that we’ve got a helluva lot of responsibility on our shoulders with planning, organizing and trying to see things through. How can you avoid to get into the same label-problematic thing as with CBS in the 80s? Do you have a good lawyer that will do some consulation with a possible contract? Man....attorneys! !...no offense to anyone out there, but yeah, there is a legal and contractual side with ‘business’. Even without plans of being “signed” to a record deal, there are still legal aspects of it all. Of course there must be the question re how the new material will sound? I hope it won´t be too modern with tuned down guitars or stuff like that….you say that it´s kind of a dark sound but hopefully with the great melodies as well? We’ll be using the same tuning as we did on the previous releases which is ½ a step down on all strings, but we won’t be doing the heavy duty down tuning that I think you’re referring to...although we might do just the low E string being dropped down low on a song or two, really not sure. The songs so far are mainly normal tuning but with everything ½ step down, like before.Yes, melodic, and yeah, dark themes to the lyrics....some interesting stories to be told about the more unpleasant side of human nature. I’ve definitely experienced being exposed to this, a very tough thing, but it’s all around us. So, musically it will probably be somewhere between the first and second albums, lyrically....maybe a bit different than both? The lyrics are true stories, based on real life....there’s some scary stuff there for sure! Why didn´t you invite James Byrd to take part? Is he still bitter about the way you parted company in the 80s? And how about Ken Mary? Is he too busy to give his former Band a shot? Will it be easier for you to find a new drummer now than it was way back? I guess no one brought it up about james, I don’t know....Kendall really is the one that has had most recent contact with James, but I don’t know where that is at. I think James is an incredible player, really an amazing talent! Ken is also amazing, really great guy too! I’ve stayed in contact with Ken with him being an old friend...you know I met Ken when he was just 15 years old?! And he was amazing even back then. Ken is president of VSR Music Group, so he’s very busy with running a record label, plus doing a few different projects. It would be great if Ken were involved in some way. As for the drummer thing....I think a lot of things today are easier than they use to be because of technology. It’s so easy to post something or send out information that hits the whole world literally in seconds! So with that in mind, it’s easier to make contact with people. I learnt that you never played live – weren´t there any offers after your fantastic debut album? I remember seeing so many Bands live in Germany mid/end of the 80s that were far behind you in terms of quality…why didn´t it happen? Was it really just because some members wanted to di bigger gigs only? We all had played many gigs over the years in other bands, cover bands mostly. The mindset of Fifth Angel from the very start was making the best use of our time to try and reach our goals....playing live did not fit in with this...writing songs and recording did. We wanted to focus time and energy on song writing. And it did work, in terms of getting signed, getting noticed, etc. If we had spent time focusing on playing gigs rather than writing songs in the early years, who knows....I like what we did, how we focused our time. So we spent our time as we did, did the first record, quickly got things going after that with getting signed to Epic/CBS....not to mention being lucky and at the right place at the right time for that....leaving not much time for playing live, plus we really were holding out for doing gigs of some real substance, rather than some bar in Seattle or something. But the live thing never came together, things all fell apart before any real live opportunities arose. I found the 2nd album being much more melodic than the 1st, much more easier to listen to, more choirs and less heaviness. Was this the price one had to pay when signing a major label? Do you think this crap of a label trying to dictate what you have to do has changed nowadays? Wasn´t it too late for this kind of melodic metal when the 2nd album was released or do you think you could have made it with proper label support? Man...some good questions, but I don’t know. There’s always a lot of shoulda’, woulda’, coulda’ done this that or the other...especially in hindsight. The musical landscape was changing when the second album was coming out, and ironically this change was coming from Seattle with grunge, and it effected the entire world.Yes the second album does have a different kind of overall vibe than the first, but at the same time we tried to preserve some of the heaviness as well. We had to do demos of songs and submit them to the label (Epic) for approval...I suppose I can understand this...they’re investing some major bucks with recording and need to know what the hell they’re spending money on! But, yes there was some sense of “Mr. Record Label” needing to know what is going on. I really don’t know how things compare with labels now. The major ones are really having problems, the industry as a whole is in somewhat of a tailspin...so with that in mind it could be that labels really want to ‘hit the mark’ as best they can and dictate more than ever, I don’t know. It is a business after all, and record labels would rather ensure that they make money rather than lose money, like any business. As for label support and success....I think the more effort or backing that is put into something, the better the chances that it could be successful....now I’m saying “could” be successful rather than “will” be successful...it’s always a gamble, you never really know. I really don’t know if things would have played out differently for Fifth Angel if there had been more label support....maybe! Provokingly asking – why didn´t you get your old logo back, at least on your homepage? Shouldn´t a band have some kind of trademark? The one of the first album is what people like me connect with you – maybe I´m not that representative but didn´t Maiden or Priest or Motörhead have their logo unchanged, creating some kind of trademark with it? Now there’s some good feedback! I’ll run this past the other guys. The logo on the first Shrapnel release is different than the same album when re-released on Epic/CBS, then the logo on the second album is just slightly different, you have to look close. Now there are two websites, fifthangel.net and fifthangel.com so I’m not sure which one you’re thinking of...fifthangel.com is very new and is under construction. By the way...Kendall designed and created the logo at fifthangel.com he’s really multitalented. Which jobs do you have (I know that Ted is a endodontist, even though can only vaguely imagine what this is…)? Can you get the time off to get into the Reunion without any problems? Yeah, I think it will be fine.....I work pretty independently. I work in the technology field, I’m actually right next to the Microsoft campus, their worldwide headquarters. I deal with internet systems and digital television systems....it’s been a good gig, interesting, challenging...it’s been good to me! John has his own computer business, Kendall is into computer graphics. How do you look at the metal scene of today? Did you all keep in touch with what happened during the years? In your case I would have been deeply frustrated seeing Bands that were and are less talented than you were selling tons of records…. Ya know....as time went on after the breakup of the band after I had left, I didn’t think much about it. I was really busy in life, had a family, a career...I guess at times when I stopped to think about it I was a little frustrated, not much really.I have no regrets with my path in life...as far as I’m concerned, I’ve had the BEST of ALL worlds....rockin’ out as a kid being in bands, getting into song writing, not just metal but other styles too....getting into my twenties and eventually being a founder of Fifth Angel and everything associated with that...then going on my path away from music, and now getting back into. I feel that I’m very lucky, it’s been a good life so far, for the most part. I must admit I can understand Bands that don´t want their stuff to be downloaded for free, in the end you cannot give your work away for free.. It’s part of the world we now live in with technology. I think this is the main reason why record labels are in a tailspin...it’s turned the industry upside down. But it is what it is, it isn’t going away, so I suppose you have to accept things and adapt. So record companies or people that want to try and make some money through music have to come up with a different business model, because the old model is no longer...they have to come up with new ideas of what can be sold and make money off of, something that cannot be downloaded for free.Downloading music for free is an interesting thing...I can see both sides. As a musician/songwriter I see the side of having your hard work with writing, developing and recording a song just being given away....that’s frustrating, it costs money to record, not to mention purchasing guitars and other equipment, although the same technology that makes downloads possible also allows inexpensive recording that sounds very good....on the other side, it is what our society and world have become....it’s really an ‘on-demand’ type of world, do a search, click here and click there, and you have what you want instantly, pretty much for free! The thing is, there is so damn much out there on the internet, a million bands or musicians or whatever, how can anyone get noticed or stand out from the crowd? Finally, I want to end this interview the way we did it most of the times in the 80´s – any words to our readers? 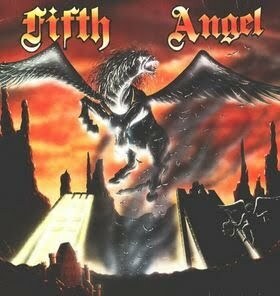 I’d like to say that the band and I really appreciate the continued interest in Fifth Angel after all these years. We are really wanting to get some new music recorded and out there for people to hear....if everything falls into place, it will happen, and we’re in the hopes it will be received well by anyone interested in listening! And who knows, maybe some live gigs out there for those that want it. As said previously, singer Ted Pilot announced his departure from the Band in the meantime, private and business matters got in the way..so the gigantic voice that put both albums to another level will be missing, damned….we re-contacted the Band about this but didn´t receive a reply, so we checked the Homepage and can inform you that the new singer is Tim Branom. As far as I can see from the facts provided there is that he is a relatively unknown, just check www.fifthangel.net for yourself. I have to admit that I´m disappointed that Ted Pilot isn´t there anymore and I doubt that such a singer can be replaced so easily (even though this is not the fault of the Band, just to make this clear). Let´s hope that were will be something good in the end coming out of all this and wish the Band all the best.